We have curated different résumé templates that we have either used, or wish we did. All templates from Canva are free and can be found on their home page. All templates from Girlboss.com can be found if you search résumé in their search tab, and $2 is the most expensive one of these custom templates can get. This template shows that you are professional but also pay attention to design. This is best for creative, design, or graphics fields, especially if you would like to elaborate more on past experiences and skills (rather than just listing them). This template is best for creative fields, such as graphic design or social media, and it's best advised not to use the heart symbol on an academic résumé. If you were to edit this template (which you can do on Canva.com), this template becomes very versatile. This template is perfect for when you need to include all past experience, rather than jobs or skills specific to one job. The paragraph at the top also allows for a cover letter effect where you can summarize your major skills and why you desire the position. Also, this beautiful font goes a long way. This template is great for any field. Simple and professional while still being unique, this template allows you to go in depth with a few key experiences, skills, and information that aligns with the specific position you are applying for. It is also very organized and easy to read, which is something you should always shoot for. Also, as you can see from the example profile, this is one of the few times where a résumé template fits in perfectly with entertainment jobs. This résumé is short but sweet, perfect for things such as internships, entertainment jobs, educational programs, or a position in which you have a few very specific relevant experiences. This template is also perfect for when you need a headshot or think it would be beneficial to include one. This template is great for when you want to elaborate in depth on a few key skills or past experiences, and then list the others. It is also perfect for fields where you need to show how professional you are but still want a unique aesthetic aspect. This template is great for when you want to show a clear common thread or timeline with your past jobs, experiences, or skills. 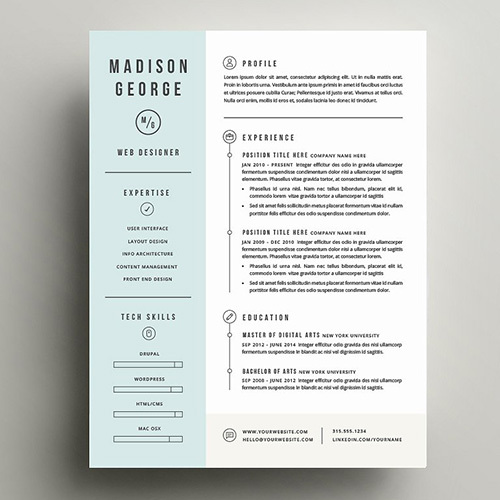 This résumé also allows you to go in depth, add design elements, and clearly separate different categories. It's great for all fields.